50 Then he led them out as far as Bethany, and, lifting up his hands, he blessed them. 51 While he was blessing them, he withdrew from them and was carried up into heaven. 52 And they worshiped him, and returned to Jerusalem with great joy; 53 and they were continually in the temple blessing God. 1 We who are strong ought to put up with the failings of the weak, and not to please ourselves. 2 Each of us must please our neighbor for the good purpose of building up the neighbor. 3 For Christ did not please himself; but, as it is written, “The insults of those who insult you have fallen on me.” 4 For whatever was written in former days was written for our instruction, so that by steadfastness and by the encouragement of the scriptures we might have hope. 5 May the God of steadfastness and encouragement grant you to live in harmony with one another, in accordance with Christ Jesus, 6 so that together you may with one voice glorify the God and Father of our Lord Jesus Christ. 7 Welcome one another, therefore, just as Christ has welcomed you, for the glory of God. It was the day before Easter, and Joe was driving along the highway with his wife, Mary, when they saw the Easter Bunny hopping across the road. Joe swerved to avoid hitting the Bunny, but unfortunately the rabbit jumped right in front of his car. The basket of eggs went flying all over the place. Candy everywhere. Joe, being a sensitive man, pulled over to the side of the road. He and Mary got out to see what had happened, and, much to their dismay, the Easter Bunny was dead. Joe felt terrible--thinking of the poor bunny, and all the children across the world who would be disappointed the next day. He turned to his wife, and said, "What should I do?" Mary told Joe not to worry, she knew exactly what to do. Opening her rather large purse, Mary pulled out a spray can. She walked over to scene of the accident, and sprayed the entire contents of the can onto the little furry animal. Miraculously, the Easter Bunny sprang back to life, jumped up, and quickly recovered all the spilled eggs and candy. Then he waved his little paw at Joe and Mary, and hopped on down the road. 20 yards out, the Easter Bunny stopped, turned around and waved again. Then he hopped on for another 20 yards, turned, waved, hopped another 20 yards and waved again! Well Joe was just astonished. He said to Mary, "What in Heaven's name was in that spray can? What did you spray on the Easter Bunny?" Mary gave a knowing smile, and silently handed the aerosol canister to Joe, pointing at the label. It read, "Hair spray. Restores life to dead hair. Adds permanent wave." Today's message, of course, is not about the resurrection of the Easter Bunny. But even though our scripture passage begins with the resurrection of Jesus, that's not ultimately the message today either. Or perhaps it would be more accurate to say that the resurrection of Jesus is ALWAYS the message, every Sunday...but our focus today and for the next seven weeks is actually the first thing Jesus' disciples DO when they encounter their risen Lord. We read in verse 9 of our passage from Matthew that "Suddenly Jesus met them and said, “Greetings!” And they came to him, took hold of his feet, and worshiped him." 2018 is a "back to basics" year for us here at First Presbyterian Church, and I can think of nothing more basic, more essential to the life of any church than that simple act of coming together at the feet of the risen Jesus, and worshiping him. So for the next seven weeks--from Easter to Pentecost--we're going to look at what the scriptures have to say about Worship, and more specifically, what kind of worship experiences we strive to create here at First Presbyterian Church, whether it's a contemporary service, a traditional service, a Wednesday night service, a Celtic service, a Christmas Eve service, a Wedding service, a Funeral, or anything in between. Several years ago, I put together an acronym for our Deacons as a simple way to remember some key principles of Presbyterian worship. 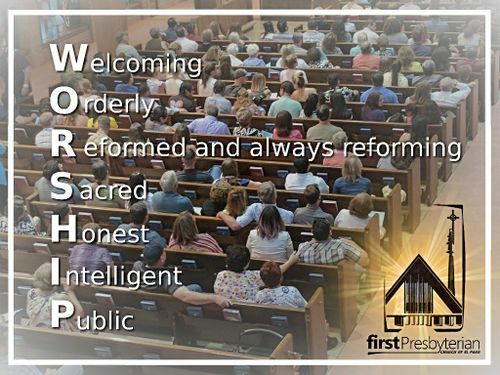 The acronym WORSHIP stands for Welcoming, Orderly, Reformed, Sacred, Honest, Intelligent, and Public. We'll talk about one of those principles each week, and today, Easter Sunday, we'll start with "Welcoming" and what it means to be a welcoming community of faith. First though, I want to talk just a little bit more about that word, "Worship." What does it mean, really? Outside of the church, it shows up a few places--sometimes we'll say "He just worships the ground she walks on." Or we'll talk about celebrity worship. But really, it's just about one of the most Christianese, churchy, religious jargony words I can think of. And it's in decline. 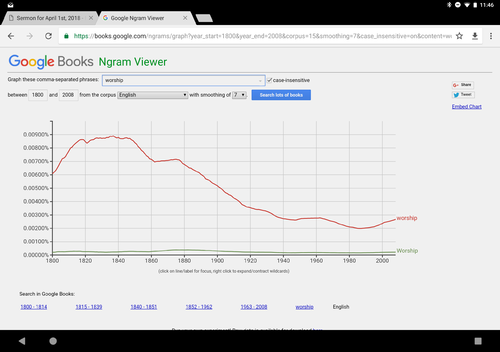 A Google analysis of printed texts for the past two hundred years shows that usage of the word "worship" peaked around 1840 and has continued to plummet downward ever since. Kind of like attendance at most Christian services of worship...maybe those two things are connected! So now more than ever, if we're going to keep doing this...if we're going to convince ourselves and anyone else in our community to do what you are doing right now, we had better have a rock solid understanding of what it is, and why it's something worth doing at all. Something worth doing. That's actually, more or less, what the word "worship" means. The word is evolved from an Old English composite word, "weorthscipe" or worth-ship. Say that five times fast, and you can see how the "th" in the middle dropped out, giving us "worship." Worth (then as now) has to do with value or esteem, as in "worthy" and "ship" is a suffix that indicates the art or practice of cultivating a discipline, as in penmanship, sportsmanship, bipartisanship, or membership. So worship, or worth-ship is simply the art or practice of ascribing worth or value to something, in our case, to God. But why God? Why not Taylor Swift or Dark Chocolate or your favorite Basketball Team? All of these things have value, and in that sense, are objects of worship for many. But what has the *most* value? What is more *worthy* than any other thing? If you ask most people in our society today, they'll say something like, "my family" or "my children" have the most value to me. But that can't be the highest, most valuable, most worthy thing, because you certainly wouldn't say my children are the most valuable thing to everyone in the universe. So you might say, well, then education is the most worthwhile thing, or happiness, or love, or freedom, or world peace. All those things (as wonderful as they are) are limited and one dimensional. Love does not guarantee peace, and sometimes is the cause of conflict or war. Freedom does not guarantee education, and education does not guarantee happiness. But if you take the sum total of all those virtues and ideals--in the words of the Apostle Paul, "whatever is true, whatever is noble, whatever is right, whatever is pure, whatever is lovely, whatever is admirable...excellent or praiseworthy" and you give all that goodness a name...say, "God" (in Old English, God and Good are the same word), then perhaps you finally have something you can truly say is worthy above all other things, has more value than anything else. Recognizing this worthiness, naming it over and over again, ultimately centering our lives around it, and teaching it to our children and to others--that's the heart of what worship is, what worship does, and why we do it. As Christians, our primary source for learning about this goodness, our primary connection to all that we call God . . . is centered around our most sacred text, the Bible, and around the story of Jesus Christ, a person we recognize as having had a special relationship, a unique connection to God, so much so that we say that Jesus was and is everything that God was and is. And when his first followers realized this fact on that very first Easter Sunday...they worshiped him. Not just then and there, but for the rest of their lives. In our passage from Luke, we read that even when Jesus finally "withdrew from them and was carried up into heaven" they continued to "worship him, and returned to Jerusalem with great joy; and they were continually in the temple blessing God." So this Easter Sunday, my challenge to you is this: What do you think is the most important thing in the world, the most valuable, worthwhile thing, not just for you and your family, but for the world and everyone in it? And what are you doing in a disciplined, consistent way to name and acknowledge that, to grow and learn and center your life around it? Welcome! to First Presbyterian Church. This is what we do here. When we gather together for worship each week, we seek out what is most valuable, most worthwhile, most worthy for ourselves and our world. We don't always have all the answers, and as human beings, sometimes we miss the mark altogether. But we explore and seek and strive together, standing in a long tradition of people who have been asking these questions for hundreds of years, borrowing and building on the wisdom of those who have gone before us, and those who are among us today. We seek nothing less than to make the world a better place. And it all begins with Welcome. In our scripture passage from Romans, Paul writes that those "Each of us must please our neighbor for the good purpose of building up the neighbor. . . Welcome one another, therefore, just as Christ has welcomed you, for the glory of God." In other words, when you extend a welcoming hand or a welcoming smile to another person...when you graciously receive someone into your world that you otherwise might not have, you bring glory to God: You recognize and acknowledge God's value and worth when you recognize and acknowledge the value and worth of your fellow human being. Welcoming others is THE first and foremost act of worshiping God. Through the years, I have often heard people compare worship to a gas station: "Pastor, I come to worship in order to be filled up, to refuel my tank so I can make it through the week ahead." That's great, and I genuinely hope people do leave here with a sense of having been filled (by the way--for those who only come on Easter and Christmas...you must have amazingly fuel efficient spiritual gas tanks!). But worship isn't just about what you get out of it. Worshiping God is also about what you put into it, and I'm not just talking about the offering plate. That's why we have opportunities for you to sing, to pray, to respond, and to greet and welcome each other. Yes, every Sunday I get up here and preach my heart out. Our musicians sing and play their hearts out. But we expect you to do your part too--so don't leave here today without making sure that you've made someone else feel welcomed in this place! That's easy. I say it every time we gather around the communion table. Here at First Presbyterian Church, we welcome everyone whom Jesus welcomed. And I can't think of a single person, rich or poor, believer or unbeliever, sinner or saint, native or foreign, whom Jesus ever turned away. If you are Presbyterian, we welcome you. If you are not Presbyterian, we welcome you. If you are a Buddhist, an Atheist, Jewish, Muslim, Hindu, Agnostic, or even if you are not quite sure what you are...we welcome you. If you are gay, straight or anything in between, we welcome you. If you are a Republican, a Democrat, or anything in between, we welcome you. If you are young or old or anything in between, we welcome you. If you are married or single or anything in between, we welcome you. Even if you are a fan of the New York Yankees or the New England Patriots..we welcome you! And this is not a classic bait and switch maneuver, either. We don't welcome you today, but secretly wait for the time when we can condemn you, convict you, or convert you to look like us, think like us, and behave like us. No. We seek the truth together; we are confident that there is truth to be found, but far less confident that any single one of us (yes, even the pastor) has a monopoly on that truth. And so we welcome all voices to the table, precisely because any one of those voices might be the one who brings a piece of the truth to light that we had not seen or not noticed before. And so all are welcome. All MUST be welcome, in order for us to truly say that we are seeking God, that we are worshipping God in spirit and in truth. All are welcome. Period. Finally, welcoming is not something that just happens here at 9:00/11:00 on Sunday mornings, once a week. If you truly believe (and I hope you do) that we are engaged in something larger than ourselves; if you truly believe that Jesus' message of hope and love has the ability to make the world a better place for everyone; and if you have been welcomed in this place, then recognizing and acknowledging that fact, worshiping God...means taking that welcome out into the world and passing it on to those who have not had the benefit of this precious hour we spend together once each week. Welcoming means inviting them, so they can. In Matthew after the disciples fell at the feet of Jesus and worshiped him on that first Easter Sunday, he said to them, "Do not be afraid; go and tell my brothers to go to Galilee; there they will see me." May the whole world see what we have seen, know what we have known, experience what we have experienced as we worship God together in this place on Easter Sunday and every Sunday. And may we welcome every single last one of them, in good faith, with great hope, and with unshakeable, unconditional love. This page was last modified on 31 March 2018, at 14:49. This page has been accessed 5,055 times.